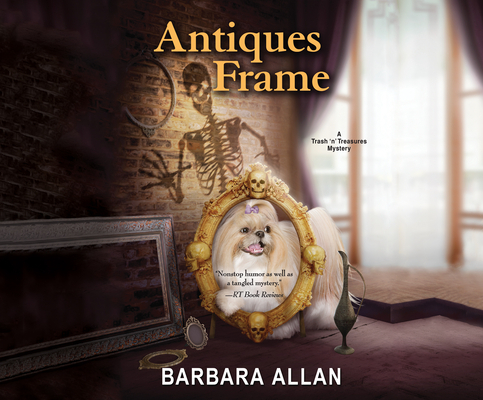 With their reality TV series Antiques Sleuths, Brandy Borne and her quaintly kooky mother, Vivian, have a real hit on their hands. But when another hit enters the picture, Brandy's implicated for the crime. With Brandy now wearing basic jailhouse orange, Vivian must largely investigate alone, sorting through a rogue's gallery of suspects that includes a too-friendly farmer's wife, a ratings-happy TV producer, a questionable husband-and-wife auctioneer team, and even the chief of police himself Aided only by the loyal shih tzu Sushi and the police dog Rocky, the wacky mother-and-daughter sleuthing team must learn the killer's identity before Brandy becomes the subject of a murder masterpiece.